Veggie Soup for the Chicken's Soul - Shameless Vision and Prayers for World Peace, Inner Peace, and Animal Liberation By Judy Carman, M.A. Judy Carman’s book Veggie Soup for the Chicken’s Soul encourages us to look positively through prayer and meditation toward a future time when there will no longer be any pain, suffering, or death. The author's approach is to counter feelings of helplessness and hopelessness that compassionate people feel when they see and read about the suffering of animals – particularly animals used for food. 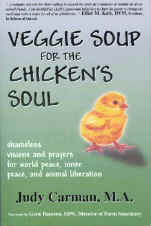 Veggie Soup for the Chicken’s Soul is an upbeat collection of inspirational writings which are a powerful antidote to the widespread animal suffering sensitive people must face just by living in this world. These heart-warming messages from many of the world’s religions and schools of thought display a commonality in their ideals of love and compassion for all of creation. To some, Judy Carman’s thoughts may seem somewhat fanciful and imbued with wishful thinking, but only if the reader does nothing in response. We do not believe that this book is meant as an end in itself; rather, it is a comforting tool for compassionate people who are actively seeking to make the world a better place for all its inhabitants. This volume can serve as an oasis of rest for the recharging of spirit and mind between and during periods of work to relieve the pain and suffering of all of God’s creatures. Judy Carman is an author and activist for animal rights, environmental protection, and world peace. Over the years she has helped establish justice groups and has also co-founded Animal Outreach of Kansas and the Worldwide Prayer Circle for Animals.